The world’s most powerful accelerator, the 27 km long Large Hadron Collider (LHC) operating at CERN in Geneva established collisions between lead nuclei, this morning, at the highest energies ever. 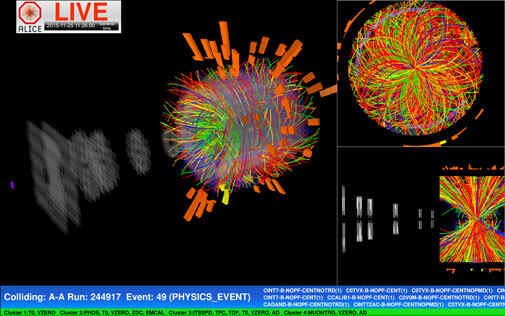 The LHC has been colliding protons at record high energy since the summer, but now the time has now come to collide large nuclei (nuclei of lead, Pb, consist of 208 neutrons and protons). The experiments aim at understanding and studying the properties of strongly interacting systems at high densities and thus the state of matter of the Universe shortly after the Big Bang. One of the very first collisions recorded between two lead ions at the LHC’s top energy. The energy in the center-of-mass system is approximately1000 TeV. Todays events bring collisions physics into a new energy scale, that of PeV (Peta-electron-volts). The ALICE detector registered tens of thousands of particles. In this live display the tracks of the particles from the collision point and through the detector are shown in colours corresponding to their mass and type. In the very beginning, just a few billionths of a second after the Big Bang, the Universe was made up of an extremely hot and dense ‘primordial soup’ consisting of the fundamental particles, especially quarks and gluons. This state is called the quark-gluon-plasma (QGP). Approximately one millionth of a second after the Big Bang, quarks and gluons became confined inside the protons and the neutrons, which are the present day constituents of the atomic nuclei. The so-called strong force, mediated by the gluons, binds the quarks to each other and - under normal circumstances, trap them inside the nuclear particles. It is however, possible to recreate a state of matter consisting of quarks and gluons, and which behaves as a liquid, in close imitation of the state of matter prevailing in the very early universe. It is this state that has now been realised at the highest temperatures ever attained in collisions using lead ions from the LHC accelerator at CERN. “The collision energy between two nuclei reaches 1000 TeV. This energy is that of a bumblebee hitting us on the cheek on a summer day. But the energy is concentrated in a volume that is approximately 10-27 (a billion-billion-billion) times smaller. The energy concentration (density) is therefore tremendous and has never been realised before under terrestrial conditions,” explains Jens Jørgen Gaardhøje, professor at the Niels Bohr Institute at the University of Copenhagen and head of the Danish research group within the ALICE experiment at CERN. Jens Jørgen Gaardhøje explains that the purpose of the collisions is to transform most of the enormous kinetic energy of the colliding atomic nuclei into matter, in the form of a host of new particles (quarks) and their antiparticles (antiquarks) in compliance with Einstein’s famous equation E=Mc2. This creates – for a fleeting moment, a small volume of matter consisting of quarks, antiquarks and gluons that has a temperature of over 4000 billion degrees. The first collisions were recorded by the LHC detectors, including the dedicated heavy-ion detector ALICE, which has significant Danish participation, immediately after the LHC’s two counter-circulating beams were aimed at each other this morning at 11:15 AM. “While it is still too early for a full analysis to have been carried out, the first collisions already tell us that more than 30,000 particles can be created in every central collision between two lead ions. This corresponds to an unprecedented energy density of around 20 GeV/fm3. This is more than 40 times the energy density of a proton,” says Jens Jørgen Gaardhøje. The extreme energy density will enable researchers to develop new and detailed models of the quark-gluon-plasma and of the strong interaction, which binds the quarks and nuclear matter together and thus understand the conditions prevailing in the early universe all the way back to a billionth of a second after the Big Bang.